The Brent Spence Bridge carries Interstates 71 and 75 over the Ohio River between Covington, Kentucky and Cincinnati, Ohio. The Brent Spence Bridge was first envisioned in the 1950’s as a high speed Ohio River crossing connecting Cincinnati to Kentucky. Several alignments were studied, including one parallel to the Cincinnati Southern Railroad Bridge in Ludlow.1 In April 1956, a site in at the mouth of Willow Creek in west Covington was chosen for a bridge site after Covington, Cincinnati and state highway officials came to an agreement on the location.9 The new bridge was projected to cost $12.57 million and take two years to construct. 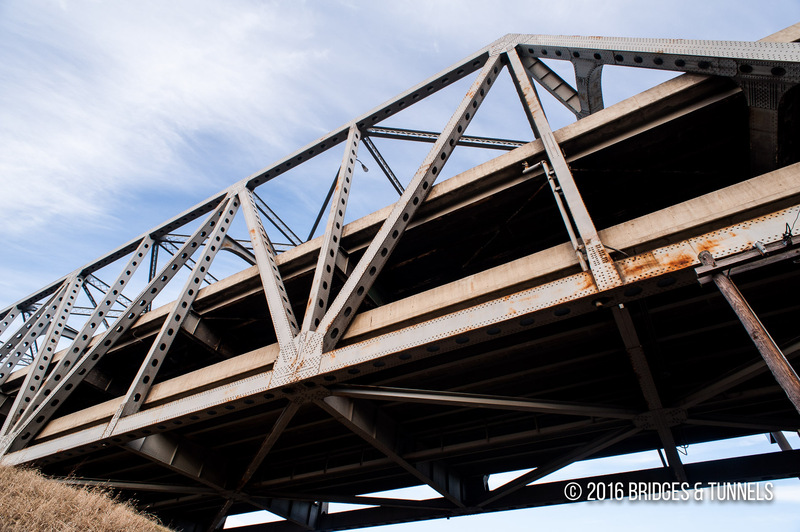 The United States Bureau of Public Roads gave final approval of the alignment, 800 feet wets of the Chesapeake & Ohio Railroad Bridge, in October. The high speed crossing envisioned included three lanes in each direction, a single or dual deck and a cantilever truss or suspension design.9 The duel deck cantilever truss bridge was later chosen with design work completed in 1959.7 Kentucky officials hoped that the new bridge would be open to traffic by 1960. The first sketch of the new Ohio River Bridge was published in the July 9, 1960 edition of the Kentucky Post.9 Actual construction of the bridge began in January 1961 but was halted shortly after a water line was discovered at one of the pier locations. Pilings for the piers began again in February and the approach piers in Kentucky was completed by March. It was not until January 1962 that bids for the remainder of the approach superstructure were let. Meanwhile, the superstructure over the Ohio River was being erected. On November 20, 1963, the Kentucky Post noted that the bridge would be named for retired northern Kentucky Congressman Brent Spence.9 The then-88-year-old Spence had served in Congress for 32 years and was a longtime Fort Thomas resident who was living in the Sinton Hotel in Cincinnati at the time. 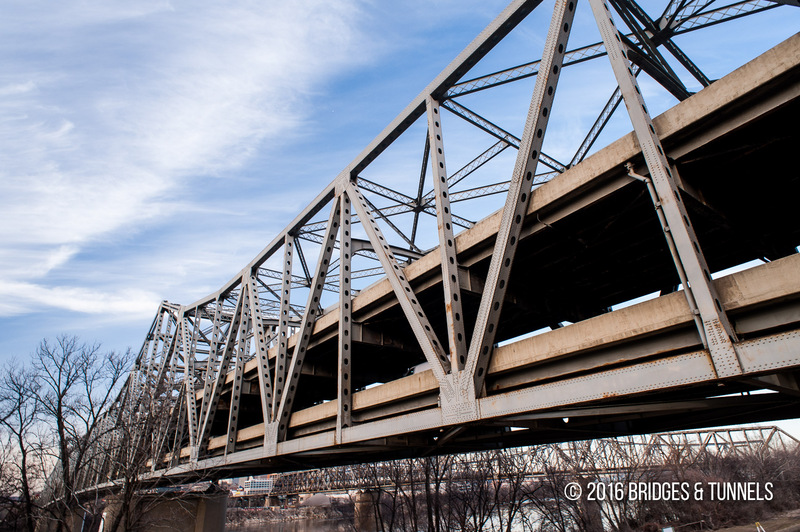 The Brent Spence Bridge opened to traffic on November 25, 1963.1 9 18 It’s opening came with little celebration or fanfare due to President Kennedy’s assassination just three days prior. The original estimate of $3.5 million 5 had increased to $5.9 million6 by the time the project was done in July 1991.4 Crews were then ordered by state environmental inspectors to excavate up to 32 tons of lead-contaminated sandblast debris that workers had buried along Interstate 75 a year prior. The sandblasted grit had been deposited in pits southwest of the Jefferson Avenue interchange and at Ninth Street and Willow Run. The state later paid a $20,000 fine for violating environmental regulations. A 1995 report by American Consulting Engineers of Lexington, Kentucky concluded that the Brent Spence Bridge would need to be replaced by 2007.7 The report noted that the bridge was carrying heavier trucks than those that existed when the span opened 32 years prior, and that it the span was fast approaching the maximum 160,000 vehicles per day (vpd) that it could handle without total gridlock. The bridge was designed for 75,000vpd and carried 139,000vpd in 1991,7148,614vpd in 2003 8 and 150,000vpd in 2008.10 It also concluded that strengthening the bridge to handle future traffic would be too costly to justify. In addition to the high traffic load, the U.S. Department of Transportation released data that reported the Brent Spence Bridge crash rate between 1995 and 2003 was one of the highest of the nation’s “functionally deficient” bridges.17 The span between those years averaged 22.8 wrecks per lane mile each year. Alternative 1: A new bridge about 1,000 feet west of the Brent Spence Bridge with five lanes in each direction that would carry Interstate 75. 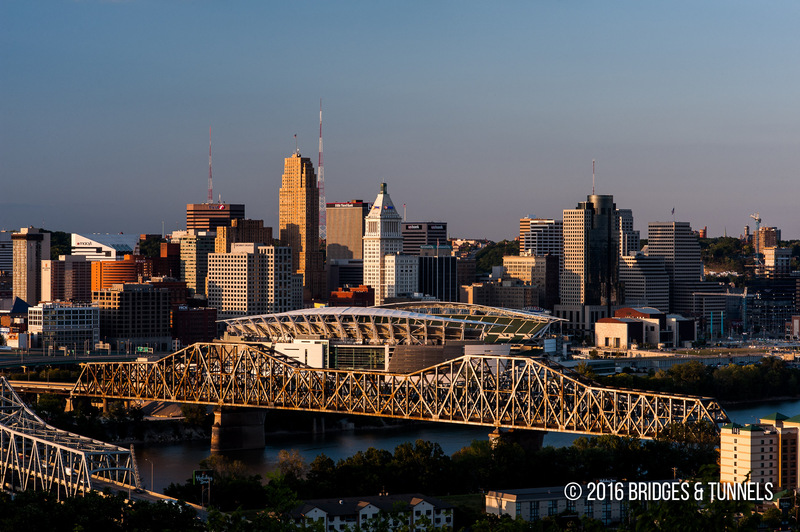 The existing Brent Spence Bridge would be renovated and would carry Interstate 71 and local traffic. This option would displace about 102 single-family residences, 58 multi-family residences and 23 commercial properties in Northern Kentucky. Total displaced: 183. Alternative 2: A new bridge about 1,000feet west of the Brent Spence Bridge with seven lanes in each direction would carry Interstate 71 and Interstate 75 traffic. 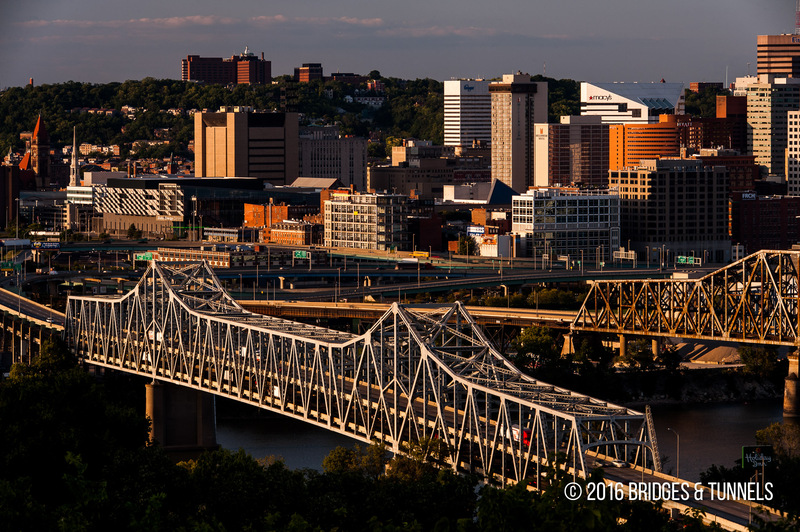 The existing Brent Spence Bridge would be renovated and handle local traffic. This option would displace about 102 single-family residences, 58 multi-family residences and 23 commercial properties in Northern Kentucky. Total displaced: 183. 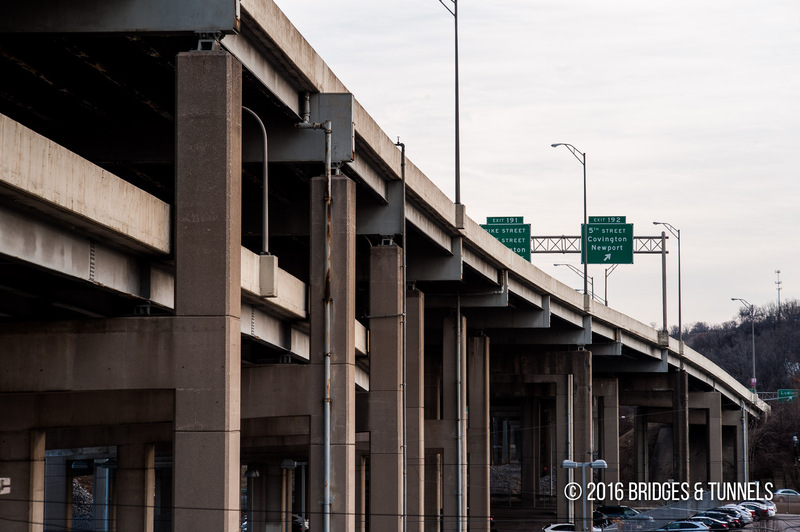 Alternative 3: A new bridge would be built adjacent to the Brent Spence Bridge with five lanes in each direction that would carry Interstate 75 traffic while a renovated Brent Spence Bridge would handle Interstate 71 and local traffic. This option would displace about 72 single-family residences, 32 multi-family residences and 19 commercial properties in Northern Kentucky. Total displaced: 123. 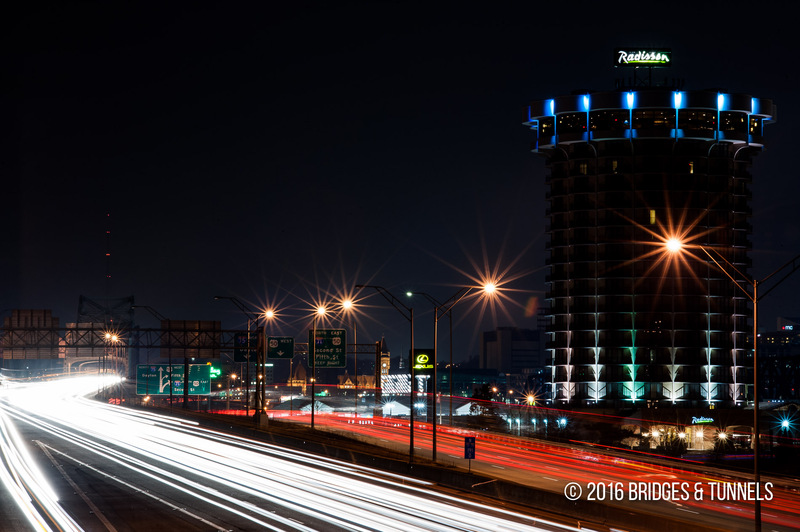 Alternative 4: The Brent Spence Bridge would be torn down and a new dual deck bridge would be built to carry five lanes of Interstate 75 traffic in each direction on the top and three lanes in each direction on the bottom for Interstate 71 and local traffic. This alternative would displace about 82 single-family residences, 32 multi-family residences and 19 commercial properties in Northern Kentucky. Total displaced: 133. Alternative 5: Two new bridges would be built on either side of the Brent Spence Bridge, one with five lanes for northbound Interstate 75 traffic and the other with five lanes for southbound Interstate 75 traffic, with a rehabilitated Brent Spence Bridge carrying three lanes of Interstate 71 and local traffic in each direction. This alternative would displace about 72 single-family residences, 24 multi-family residences and 18 commercial properties in Northern Kentucky. Total displaced: 114. A group of local officials from northern Kentucky and southwestern Ohio banded together under the moniker “Bridge Builders” after being urged to do so by U.S. Senators George Voinovich of Ohio and Jim Bunning of Kentucky.12 The goal was to accelerate the selection of a recommended preferred alternative of a new Brent Spence Bridge. By December, the estimated cost of a new Brent Spence Bridge had risen to $3 billion 10 from $1 billion in 2005.27 The new estimates were adjusted for inflation over the life of the project set at nine years, whereas the old estimates were based on the value of the dollar when the estimates were made.23 The new estimates also took into account the project scope’s increase, the skyrocketing cost of concrete and steel and the higher cost of fuel. According to a report released by the “Bridge Builders,” a bridge leading through Covington would lead to a loss of $22.5 in property values and indirect economic loss.12 The replacement or parallel construction of the bridge would save the region $748 million in 2005 dollars, including $684 million in savings on shipping that would be derived from a reduction in traffic congestion. Motorists would see a time reduction valued at $51 million a year. On April 18, regional officials and transportation planners in Ohio and Kentucky stated that they were poised to recommend constructing a second span over the Ohio immediately west of the Brent Spence Bridge.30 Under the proposal, the Brent Spence would carry Interstate 71 and local traffic, would the new crossing would carry Interstate 75. In September, Mark Policinski, executive director of the Ohio-Kentucky-Indiana (OKI) Regional Council of Governments, stated that both Kentucky and Ohio will need to raise $80 million each over the next six years to help pay for the $2 billion project.32 An $800 million federal highway authorization legislation would cover the final planning of the parallel span and initial construction costs, and the state matches would need to be provided over the six-year lifespan of the spending bill. Arch bridge design, with a 173-foot width, 274-foot height above water and a 1,000-foot main span. The base width is 209-feet. 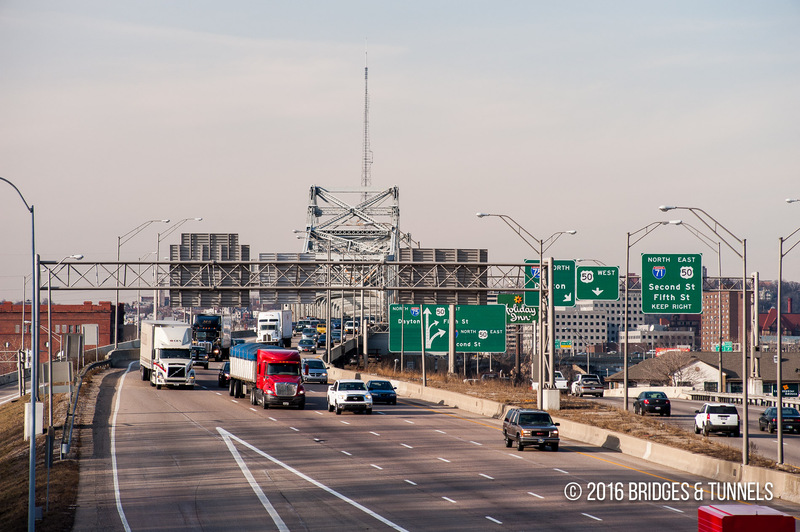 The top deck would carry six lanes for Interstate 75 southbound and northbound on two 64-foot decks, while the bottom deck southbound would carry local traffic on three lanes with a 70-foot deck and northbound Interstate 71 traffic on two lanes with a 70-foot deck. On March 23, 2011, the Ohio Transportation Review Advisory Council (TRAC) recommended against providing $27.2 million in the 2011-2012 budget year towards a detailed design of the Brent Spence Bridge because the project leaders did not expect to need the money until at least July 1, 2012, or fiscal year 2013. In the interm, the project has the money to complete preliminary design work.34 In 2010, TRAC recommended that the $27.2 million be spent on a detailed design of the bridge. TRAC is a nine-member panel that evaluates spending on projects. With the alignment of the Brent Spence supplementary bridge all but set in stone, Covington, Kentucky officials reached out to the public in how to offset the loss of Goebel Park that the new highway is likely to take.35 The city held the first of two public meetings on October 24, 2010 that showed the amount of land that would be removed from Goebel Park in MainStrasse for the new bridge and approach. A visiting student that works for a property lawyers Melbourne office, told me that, by law, the Kentucky Transportation Cabinet must provide compensation in Goebel Park for whatever it removes or modifies, either with additional land or new amenities. With federal funding all but non-existant, local political and business leaders from the Cincinnati region sought out ideas for jump starting construction of the now $2.3 billion bridge 36 over the Ohio River in a meeting held in July 2011.33 One of the major hurdles to the financing is how to match $450 million in federal funds with a local match that is required to move ahead with planning and construction. One of the proposals is to tack on a $20 driver’s license fee to raise $40 million a year from an estimated two millon drivers in an eight county region surrounding the Brent Spence Bridge. The money would be used to back a bond issue that would cover Cincinnati’s local match and help finance development of an electronic tolling system, such as EZ-Pass, which would charge drivers a nominal toll to cross the bridge. Todd Portune, Hamilton County, Ohio Commissioner, agreed that the idea was worth exploring further. He sought state funding at a July 25 county Transportation Improvement District meeting to study local-match alternatives, such as tolling.33 Ohio’s budget bill passed that summer allowed the state’s 14 districts to request grants up to $250,000 for specific projects, such as studies. One of the disadvantages to a toll over the new span is that some traffic will divert to local or other interstate spans to bypass the toll plaza.33 Such a proposal for the new crossing would need to be explored with other Ohio River bridges in the Cincinnati region. 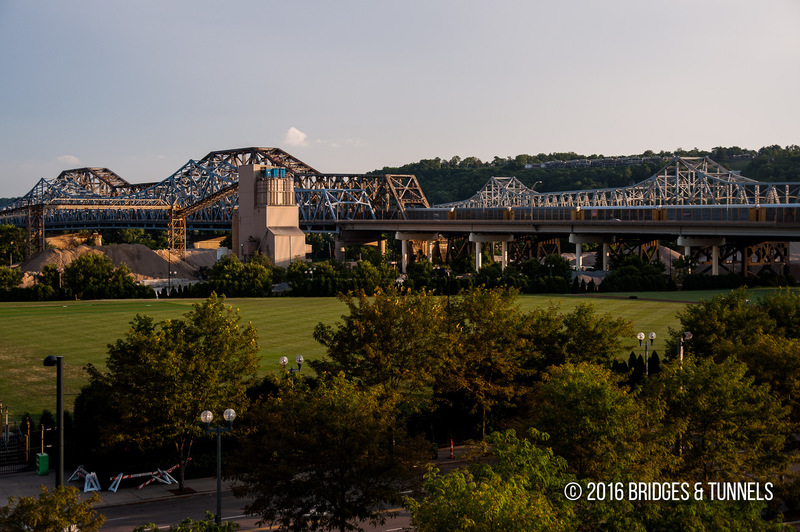 Funding for the bridge has become paramount following a June 24 accident on the Brent Spence Bridge.33 The motorist, who had run out of gas during the morning rush hour, was knocked into the Ohio River by another motorist after he had gotten out of the vehicle. The bridge lacked emergency breakdown shoulders. “I-71/75 Brent Spence Bridge.” Cincinnati Transit 2007. 10 May 2005Article. Brent Spence Bridge. Parsons Quade & Douglas 2005. 10 Dec. 2005 Article. Dias, Monica. “Highway engineer witnessed changes in design, attitudes.” Kentucky Post 6 July 1990. 19 Nov. 2007: 2K. Dias, Monica. “Done at least 75.” Kentucky Post 20 Aug. 1994. 19 Nov. 2007: 1K. Dias, Monica. “The awful truth: I-75’s ‘inconvenience’ is near.” Kentucky Post 4 May 1990. 19 Nov. 2007: 1K. “Blasting done but bridge work on I-75 goes on.” Kentucky Post 29 Apr. 1991. 19 Nov. 2007: 3K. Dias, Monica. “Traffic, weight strain I-75 bridge.” Kentucky Post 8 Dec. 1995. 26 Nov. 2007: 1K. “Traffic Counts and Count Stations.” Kentucky Transportation Cabinet 2007. 26 Nov. 2007 Map. Reis, Jim. “Crossing the Ohio.” Kentucky Post 15 Dec. 3003. 26 Nov. 2007: 5K. “Toll idea refuses to die.” Cincinnati Enquirer 8 Feb. 2009. 24 Feb. 2009. 9, Barry M. “Answers on bridge en route.” Cincinnati Enquirer 19 Jan. 2009. 24 Feb. 2009. Crowley, Patrick. “Officials: Speed Brent Spence work.” Kentucky Enquirer 9 Oct. 2008. 24 Feb. 2009. “Officials: Build adjacent bridge.” Cincinnati Enquirer 13 Dec. 2008. 24 Feb. 2009. Crowley, Patrick. “It’s an ‘urban bridge tax’.” Kentucky Enquirer 1 July 2008. 24 Feb. 2009. McGurk, Margaret A. “List of new routes for Brent Spence delayed.” Cincinnati Enquirer 23 Feb. 2008. 24 Feb. 2009. Crowley, Patrick. “House passes bridge bill.” Cincinnati Enquirer 6 March 2008. 25 Feb. 2009. Rutledge, Mike. “Bridge crash rate high.” Kentucky Enquirer 15 Sept. 2007. 24 Feb. 2009. Truong, Quan. “Brent Spence sound, but obsolete.” Cincinnati Enquirer 2 Aug. 2007. 25 Feb. 2009. Duke, Kerry. “Bridge work options disruptive.” Cincinnati Post 3 April 2007. 25 Feb. 2009. “Property needed.” Cincinnati Post 3 April 2007. 25 Feb. 2009. Eigelbach, Kevin. “Bridge options need land.” Cincinnati Post 11 April 2007. 25 Feb. 2009. Duke, Kerry. “Toll option for Brent Spence studied.” Cincinnati Post 9 Sept. 2006. 25 Feb. 2009. Duke, Kerry. “Brent Spence price tag doubles.” Cincinnati Post 29 Sept. 2006. 25 Feb. 2009. Rutledge, Mike. “Brent Spence plans presented.” Cincinnati Enquirer 24 March 2006. 25 Feb. 2009. Rulon, Malia. “$45M for bridge study OK’d.” Cincinnati Enquirer 24 March 2006. 25 Feb. 2009. Driehaus, Bob. “Bridge will be one of a kind.” Cincinnati Post 7 Oct. 2005. 25 Feb. 2009. Klepal, Dan. “I-71/75 bridge replacement cost tops $1B.” Cincinnati Enquirer 18 June 2005. 25 Feb. 2009. Pilcher, James. “.” Cincinnati Enquirer 9 Jan. 2005. 25 Feb. 2009. Crowley, Patrick. “Brent Spence may bring in $800M.” Cincinnati Enquirer 2 March 2009. 2 March 2009. Horstman, Barry M. “New bridge next to Brent Spence?” Cincinnati Enquirer 18 April 2009. 2 May 2009. 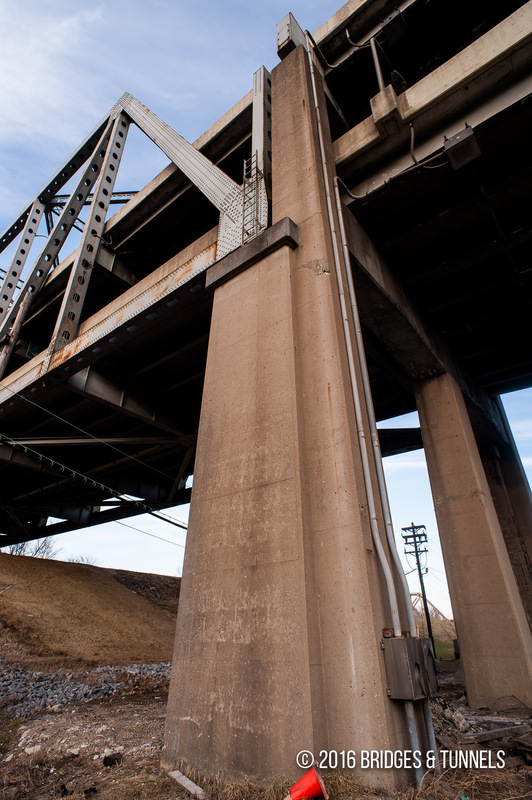 Horstman, Barry M. “Bridge near Brent Spence in 2015?” Cincinnati Enquirer 21 April 2009. 2 May 2009. Crowley, Patrick. “Bridge to costs states $160 million.” Kentucky Post 6 Sept. 2009. 9 Sept. 2009. Monk, Dan. “New Brent Spence Bridge pay plan floated.” Cincinnati Business Courier 22 July 2011. 27 Sept. 2011 Article. Rutledge, Mike. “Design funds for bridge project won’t be missed, for now.” Cincinnati Enquirer 24 March 2011. 27 Sept. 2011. Wartman, Scott. “New bridge would mean big changes to Goebel Park.” Kentucky Post 25 Oct. 2010. 27 Sept. 2011. Horstman, Barry M. “2011 a big year for Brent Spence plans.”Cincinnati Enquirer 18 Dec. 2010. 27 Sept. 2011. Benschoten, Amanda Van. “Brent Spence a ‘mess’.” Cincinnati Enquirer 24 Sept. 2010. 27 Sept. 2011. Horstman, Barry M. “Brent Spence Bridge designs narrowed to six.” Cincinnati Enquirer 1 Feb. 2010. 28 Sept. 2011.